Drive. The route is marked with special seagull signs and leads you to over 20 of San Diego’s best attractions within a 59-mile loop. Some of my favorites include downtown San Diego, Harbor and Shelter Islands, Pt. Loma and the Cabrillo National Monument with tidepools, Soledad Mountain, La Jolla Cove, Old Town, Presidio Park, Balboa Park, Seaport Village, and Sunset Cliffs Boulevard. For printed maps, go to the International Visitor Information Center at 1140 N. Harbor Drive, San Diego, across from the B Street Cruise Ship Terminal. The Information Center is open 9 am to 4 pm, October through May and 9 am to 5 pm, June through April, 7 days a week. Plan to spend at least 3+ hours to complete the drive, as you will certainly want to spend some time at many of the locations along the way. For more detailed information about the scenic drive, click on this link. Once you’ve made the drive, you’ll have a much better idea what you want to explore, where you want to return for a picnic or where you’d like to take more photos! 2. Stroll through the Mercato Farmers’ Market on W. Cedar Street in Little Italy. Every Saturday morning, from 8 am to 2 pm, W. Cedar St. is closed to all vehicle traffic between Kettner Blvd and Front St. You can stroll the market along with the crowds of people who know this is the best place to find fresh and locally produced cheeses, honey, flowers, produce, meat, seafood, green smoothies, artisan baked goods, and much more! Live bands set the mood with great music and vendors also display handmade art, jewelry and gifts. Go early if you want to have an easier time finding parking. But do plan to stay awhile. Enjoy free samples, buy specialty food items for a home-cooked meal, and enjoy the music and ambience. Even the local Little Italy residents do their shopping here. It makes a great date or family outing, and it’s something you can do over and over again without tiring of it. It’s the closest thing San Diego has to Seattle’s Pike Place Market. 3. Visit Old Town San Diego State Historic Park. Here is where San Diego really had its beginnings. Originally a Mexican pueblo, it eventually became an American settlement. There are five original adobe buildings, dating back to 1821. In addition, there are museums, retail shops, and restaurants. Kids love to check out the old schoolhouse and the iron prison, as well as the carriage house and stables. There’s even a blacksmith shop run by volunteers who are happy to explain what they are doing. See all the rooms in La Casa de Estudillo and imagine what it would be like to live in the 1800’s. There are free tours of the park every day at 11:00 am and 2:00 pm, leaving from the Robinson-Rose Visitors Center. It would be easy to spend several hours at Old Town soaking in all the history. If you want a treat for the kids, there’s an old-fashioned candy store. You can also watch tortillas being made through the windows of the Old Town Mexican Cafe. For more information about hours and ongoing activities, see the California State Park website. If you’re headed to Old Town, another great free activity is the San Diego Mormon Battalion Historic Site. Parking is free behind this visitor center, making it very easy to visit when you have just an hour or two. 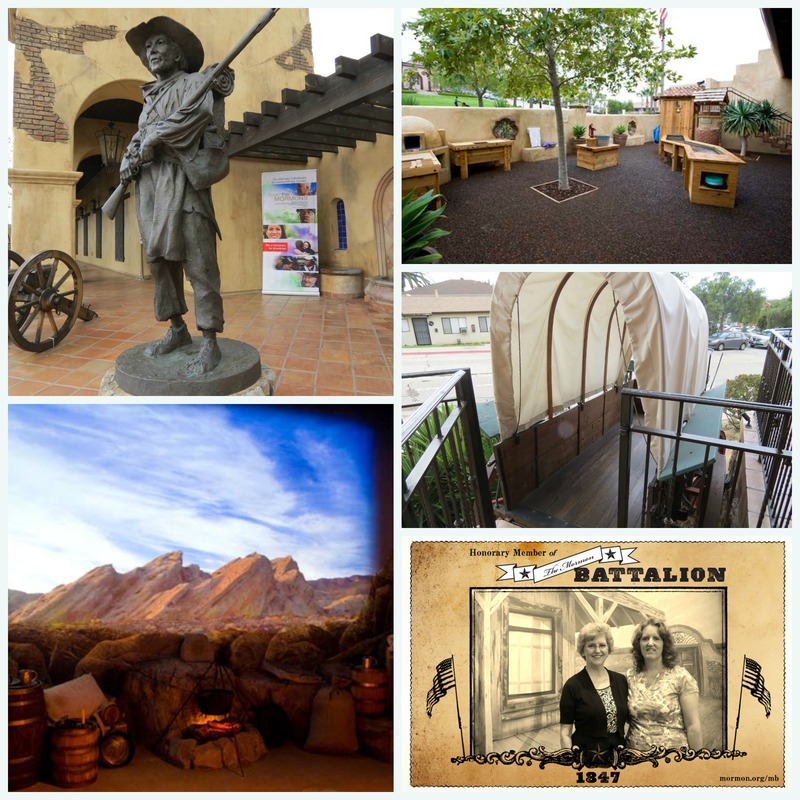 This is a beautiful visitor center, dedicated to portraying the history, accomplishments, and faith of the Mormon Battalion (1846-47), which made significant contributions to the settlement of Old Town San Diego. Think “Disney-style”! Guides in period costume welcome you and lead you through an interactive tour which includes talking portraits on the wall and rooms that are outfitted to take you back in history–to an Iowan campsite, a military post store, and a desert camp, as well as a replica of the first San Diego courthouse. In the courtyard, kids can pan for gold or learn how the early pioneers made oven-baked bricks. There’s a miniature covered wagon for kids to sit in, and the front porch is filled with rocking chairs (great place to watch the sun set over Old Town!). A second-story lookout tower gives great views of the rest of Old Town and Heritage Park. While you are there, you can look up information about Mormon Battalion members and have a free photograph taken and emailed to you for a souvenir. San Diego is full of rich treasures, ready to explore. I hope you have a wonderful time visiting San Diego without emptying your wallet. For more ideas, check out my first list of the best free things to do in San Diego here. And if you enjoyed this post, you’re going to love 10 Unique & Free Things to Do in San Diego! You might also like my 10 Reasons to Visit Liberty Station — another really fun place to spend a day in San Diego! 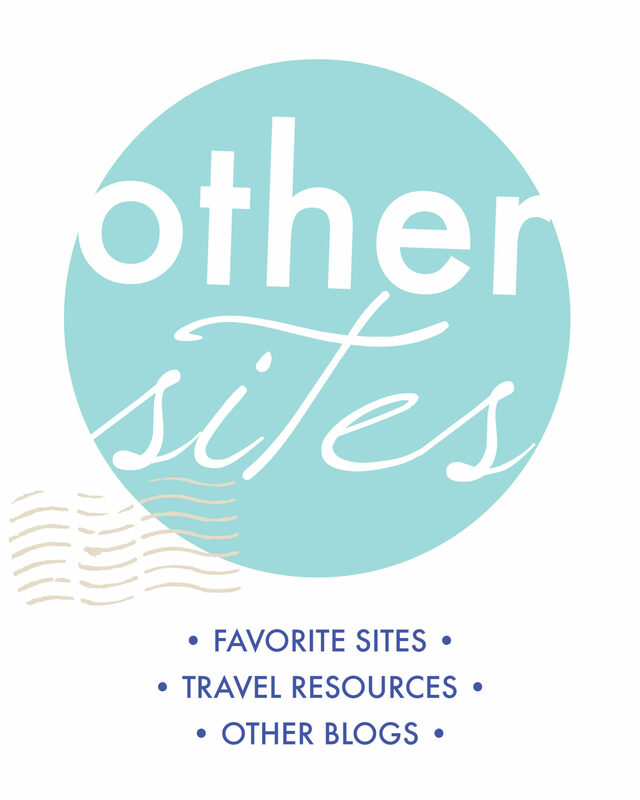 BONUS: I’ve just finished a post on 100 Date Ideas in San Diego — many of them are free and can be adapted to doing with families as well as couples. Oh, this post made me home sick. I love San Diego and you pointed out so many of things I enjoy about the city! Very close to Mission Beach is Costa Brava on Garnet Ave in Pacific Beach. I just went there this week with friends to enjoy their tapas menu. Amazing! There was live guitar music, too. We also like Su Casa in south La Jolla. If you’re looking for something other than Mexican, we really liked the casual trendy place in La Jolla called Promiscuous Fork. It’s close to Windansea Beach, a great place to watch the sunset. You could get your dinner to go and enjoy a picnic on the beach. San Diego is on of my favorite cities in CA. I love your idea of heading to the market, it is a great way to support the local farmers and sample fresh produce. I visited San Diego once with my family decades ago but would love to go back. The farmers market appeals to me particularly. Very nice suggestions on free things to do in San Diego. I am a big fan of markets so if I were there on Saturday I would love to visit and buy things for a picnic. I like the fact that there is live music too. LOVE IT! I lived in PB for 5 years back at the turn of the century (wow that made me sound old)! I loved Old Town San Diego. I used to go to church there and then would walk into the actual living Mission. Back then the Bazaar was really awesome with restaurants and shops so we would then walk around and then eat dinner. I just visited some cities in USA, so I’ve never been in San Diego. It seems like a nice city to explore. The history park is a place I wish to go!! I had no idea San Diego had a Little Italy, let a alone a farmer’s market there. When you say every Saturday, is that really all year round? I like how we can explore places for free! Most think they they should spend a lot to see beautiful things. I love the mix of nature and local livelihood on your post and how they close the roads every Saturday! Admirable! I have only been to San Diego once, but I absolutely loved it and free activities make it even better. I could be happy driving around the coast forever! Now that would be more than a day for me. Love drives and spending lots of time in farmer’s markets. And I am curious about the Old Town San Diego State Historic Park. San Diego is so pretty, been way too long since I went! I’m so glad I came across this. I’m headed to San Diego next month, this will definitely come in handy. Thank you! Okay, Melody, when ARE you going to come to San Diego again? It would sure be fun to see you! I love San Diego, what a fabulous city! Just being there feels like a privilege! It IS a beautiful city with a wide variety of things to do. But mostly it’s the gorgeous weather! 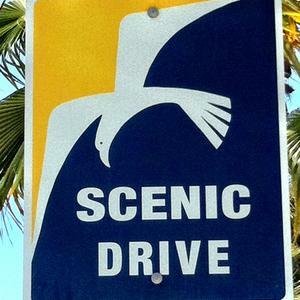 Your photos from Scenic Drive are lovely. I like that in three hours you can see so much of San Diego’s attractions and natural beauty. Since I’m always looking for free things to do in new destinations this is a top pick. 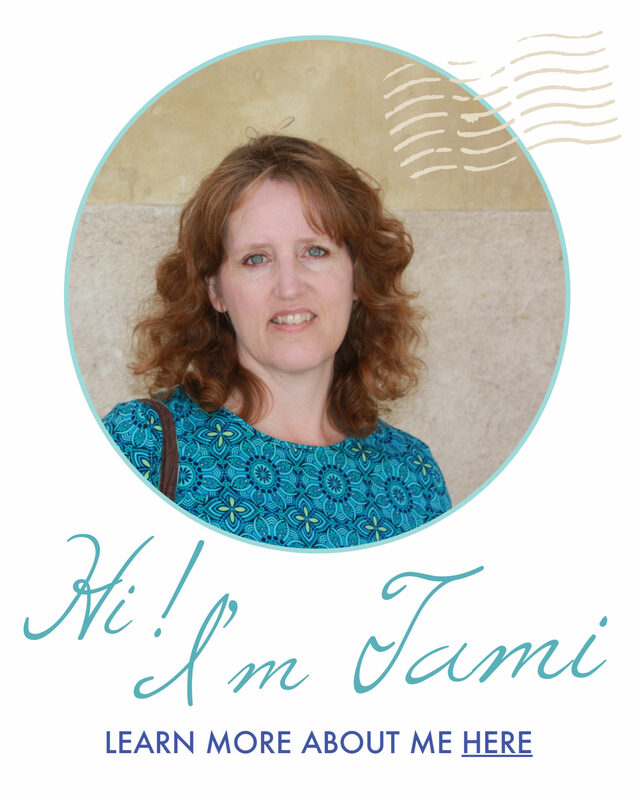 San Diego is on my bucket list for a while and learning that they are so many free things to be done and seen there is definitely inspiring, Tami. Would you consider it as a good budget destination? San Diego has a lot to offer that doesn’t cost anything at all… Beaches, beautiful hiking trails, and parks, scenic drive, and strolling the waterfront. Lodging can be expensive, just like any city, but if you choose carefully and don’t go crazy with the tourist attractions like Sea World and Legoland, you can definitely visit on a budget.